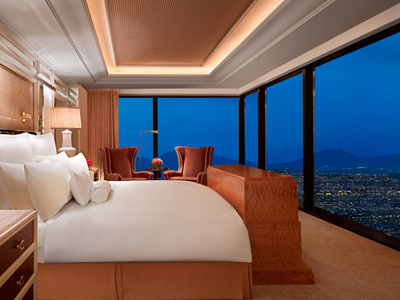 Hurry and reserve your room at the beautiful Encore Las Vegas for an amazing stay. This special offer gets you up to 15% off your rates when you make your reservation online. 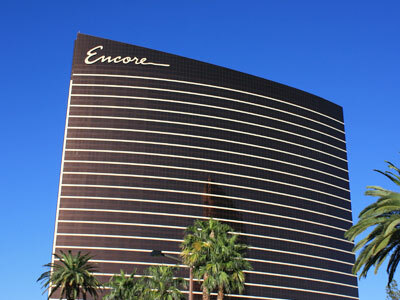 Encore Las Vegas is a luxury 5 star resort located at the far end of the Strip. Part of the Wynn family, this new tower has become the trendier location with full access to all of Wynn’s amenities, including shows, a casino, restaurants, etc… and the only golf course on the Strip. The all suite tower is 50 stories tall with a variety of suite sizes and views to choose from. 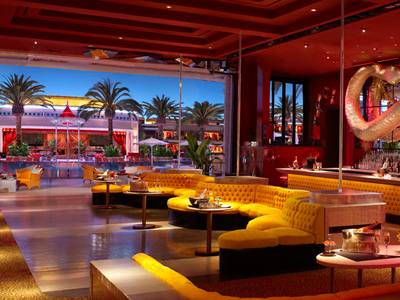 Encore Las Vegas is elegant, refined, trendy and upscale all at the same time. Stay at this sister hotel to the flagship Wynn and experience larger suite-style rooms, the Sky Casino, nightclubs and restaurants. Nightclub XS spills the vibrant, decadent nighttime crowds out into the pool areas. If you can’t wait for the nightlife to begin, head to the Beach Club and find a European style daytime party around the three tiered pools. The restaurants are smaller and more intimate than those at Wynn; enjoy favorites such as Sinatra’s, Wazuzu and Andrea’s. Catch a show at the Encore Theater which features such acts as Diana Ross or Harry Connick, Jr or step over to the Wynn and see the breathtaking La Reve water show. Once you are done with the Vegas nightlife, head back to your luxurious room and revel in the exquisitely comfortable Dream beds, draw the drapes remotely while in bed and close your eyes to dream of the next day spent in the fanciful world of Encore. Spa/Salon: The Forbes Five Star-rated Spa and Salon welcomes you into the grand glass-enclosed Spa Court when you enter. Choose from massages, body treatments and facials in one of their 37 treatment rooms or 14 naturally-lit garden rooms. Four couples’ suites for massage are also available. Pool: The centerpiece of the hotel, the two pools reminiscent of the French Riveria welcome you into their sculpted gardens and luxurious cabanas. The mosaic of butterflies adorning the pool floor will encourage you to visit the flower gardens and wading pool around the main pool. A resort pool and European pool with center bar and gaming will call to you to enjoy the white chaises or comfy couches. The Encore Beach Club is the the ultimate pool party. Daybeds and plush lounges surround the pool. Sun yourself on one of the pool's lily pads or dance to the exciting music on the dance floor in the middle of the pool. Yes, this club glitters in excess with an elegant gold décor that signals a first-class nightclub experience. 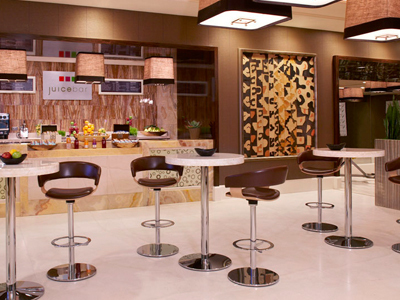 The gorgeous indoor club is large, boasting over 13,000 sq. ft. with a huge dance floor and magnificent seating with plush booths filled with beautiful people. Andrea’s brings a distinctive concept to the Wynn/Encore guest with “vibe dining,” incorporating a restaurant and nightlife experience into one environment. Sinatra at Encore is a tribute in every way to Frank Sinatra, from the Italian menu to the décor. Much of Frank’s personal memorabilia is on display, such as an Emmy, Oscar, Grammy, gold records and many personal photos. Chef Theo Schoenegger has recreated classic Italian cuisine and added his own masterful interpretation. My stay here was excellent. The staff members do everything and anything to make you happy! I was impressed. The room was awesome and so were the views. It was a pretty quiet atmosphere for the most part and I absolutely loved the pool. Steve Wynn’s hotels are THE BEST on the strip! Encore was marvelous! It was a very special anniversary for me and my husband, so romantic. The staff was welcoming, and the dining was fab! To be honest, we never wanted to leave our room! The bathroom felt like a spa, with extra plus towels and a robe, and there were flat screen TV’s everywhere! This hotel provides luxury and attention to detail! We always had fluffy clean towels, the room was immaculate. We were provided with robes and there was a flat screen TV in the bathroom! The bed was really really nice. My husband is over 6′ tall and his feet did not dangle off the bed. The room had a docking station for my phone. Best of all has to be the View! It was spectacular from the 57th Floor!!! 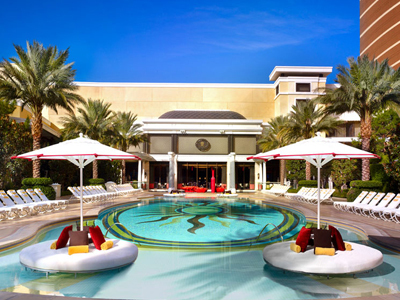 This is universally known as one of the best Las Vegas resorts there is, period. This resort will blow you away with its beauty, luxury, and stunning decor. Frankly, this was my first hotel in Las Vegas and I am having trouble staying anywhere else because I was so spoiled by this masterpiece. Even the standard suites are luxurious and stunning, with the most comfortable beds and robes I think I’ve ever felt. It is well worth the price, although dining is very expensive. You also get to enjoy Wynn, it’s sister resort. Went here for our honeymoon because we didn’t want to travel out of the country. Phenomenal to say the least. Very inclusive. Great pool. Great staff. Everyone willing to wait on you. Felt like royalty. Appreciate that even getting to the rooms requires card with a staff waiting 24 hours to ensure only those who have rooms are on the floors. Wish I knew cheaper dining was across the way at mall. Cafe and at Wynn near sportsbook for more inexpensive meals. Curious with the guy that was looking for a free drink during gaming experience? This isn’t a hotel for you if you are attempting to do Vegas on a budget or get a drink off putting $20 in a slot machine. The old downtown and other spots on the strip is filled with those. Again this is why Encore is top notch and will get my business again. This is the worst hotel in the world, the over paid staff all stand around paying no attention to any guest. Free drinks while you play the games, if you want to wait two hours. Simply the worst that was in Nov 2012. Very nice experience I will return again with my family. We were totally impresse with this hotel. The service was impeccable. Our room was huge and had lots of gadgets. Our room overlooked the pool, great view for us. We ate at Botero, and it was outstanding! The casino was not as smoky as the other hotels, and there was a pleasant smell to this hotel. Our only complaint is it is on the one end of the strip, so it was quite a walk to get to places. This hotel was the perfect choice for us. We like staying at high end hotels. The room was spacious and comfortable. There was a mini bar stocked for us. It is expensive, but convenience at your finger tips. We don’t like loud music, so we requested a room away from the pool area Perfect! Housekeeping was there twice a day! Love the layout of this hotel. Easy to navigate and you do not have walk forever to get to your room. It is not as busy as some of the hotels which was a great feature for us. Can’t wait to go back!